You might have noticed that I write a lot. I write blog posts all week long (in theory publishing them during the week but they seem to pile up towards the end of the week). I also write a monthly column in Don McAllister’s ScreenCasts Online Magazine. Today I write all of my articles using either my MacBook Pro at my desk with the Apple Bluetooth keyboard that I love, or on my MacBook when I’m on the go with the less wonderful but still adequate keyboard. For the blog I use an app called MarsEdit from red-sweater.com which has long been a favorite amongst bloggers. I write in HTML in MarsEdit and when I’m done I can whoosh the posts up to my blog and publish from there. One advantage of this workflow is that I can partially write a post on one device, whoosh it up as a Draft, and then refresh on MarsEdit on the other Mac and keep writing. I do have to remember to refresh each time to make sure I’m working on the same version but 90% of the time it works for me. That’s a lot of preamble with no problem to be solved yet, isn’t it? I think the problem I’m trying to solve is FOMO – fear of missing out. All of the cool kids now are using Markdown instead of HTML to write, mostly because it’s much more human readable so easier to edit, and they’re doing their blogging on the go using an iPad. Don likes the SCO articles to come in Markdown so I’ve been forced to use it. I use Byword from bywordapp.com, and while it’s fine I don’t love it. Might not even be Byword’s fault, it might be that Markdown just isn’t natural for me yet. Last week I heard Jason Snell of Six Colors say that he uses an app called 1Writer from 1writerapp.com for the iPad and iPhone to do his blogging. And that’s where the FOMO kicked into high gear. 1Writer is $4.99US so that seemed a small price to pay to find out if I could get on this Markdown/iPad blogging craze. This very article is now being written on my 12.9″ iPad Pro using 1Writer. I’d like to jump right into the middle of what I like about 1Writer. First of all, there’s a row of extra keys that show above the onscreen keyboard, or show onscreen when you’re using the Type Cover. This extra row of keys is called the Extended Keyboard, and it can be disabled in Settings if you don’t need it. I like it because it gives me instant access to create headings, create bulleted lists, links and embed images. It takes away one of my biggest problems with Markdown, that I can’t seem to remember the syntax. I know these things aren’t hard in Markdown, but I can’t remember whether it’s one asterisk at the beginning to make something italics, or does one asterisk make it a bullet. I can’t remember if it’s hash marks to do headings or asterisks. With 1Writer I have a button that says B for bold (which is two asterisks on either side of the word by the way), and a bullet button that starts a bulleted list, and if you hit it again it changes it to a numbered list. Again, adding that little dash and a space isn’t hard, but I just can’t remember which character does it. Let’s say I want to copy a link from a website and format it properly in Markdown. In 1Writer if I’ve copied the url, all I have to do is tap the link button in that extra row and I get a choice of entering a new link or plopping in the one from the clipboard. If I choose to plop, it automatically highlights the text area for me to type in what I want people to see to represent that link. SUPER easy! You can even enter links just as their text, as in http://Podfeet.com and 1Writer, when you export to HTML or formatted text, will respect it as a “real” link. Pretty cool. You can also use “real” HTML if you want in 1Writer which is huge for me. For example, I like to put smaller images to one side or the other in my posts and have the text wrap around them. Often I need to resize the images to make them fit nicely. Bizarrely, neither of these things are possible in Markdown links, so if I want my posts to look nice, I have to use HTML. 1Writer letting me use Markdown for simple stuff and HTML for the trickier bits is the best of both worlds. I find 1Writer a bit clumsy when selecting text, which you have to do often when editing. It’s almost impossible to select a horizontal line of text by holding and then dragging with your finger, because the document instantly begins to scroll down selecting multiple paragraphs. It’s something I might get used to over time but it really doesn’t work well. I mentioned the extra row of keys. Well there’s an extra extra row of keys below that, which oddly contains many of the same keys, like heading, bold, italics, bullets, check boxes, links and images. I haven’t figured out why there are two sets of keys. I did notice that if I use slideover to bring up another app, like Telegram, the original set of extra keys disappears and only the secondary set is there. The extra keys are placed on either side of the auto-complete text from iOS. One of my favorite things about 1Writer is the ability to preview my work. You get access to the preview in a pretty unintuitive way. To the right of that second extra row of keys is a downward facing chevron. Tap on that key and at the top right will be revealed a Preview button. Tap that and you can see your links and images inline with your text. Works really well but it did take me a while to figure out where that Preview button was, and if I don’t use 1Writer for a little while it takes a while for me to remember where it’s hidden. There’s one tool I can’t live without when writing, and that’s TextExpander. It’s the third app I install on a new Mac, after 1Password and Dropbox. Years ago I tried using it on iOS but so few apps supported it, I gave up. Those times have changed, there are now 75 apps for iOS that support TextExpander! And lucky for me, 1Writer is one of them. By the way I don’t mean 1Writer supports TextExpander with a 3rd party keyboard, but native within the app so you can just type away on any keyboard and get access to your snippets. If you can find Settings in 1Writer (Settings are revealed when you tap that downward chevron that hides the second row of keys), you can simply flip a switch to turn on TextExpander and then give it permission to sync your snippets. TextExpander integration on 1Writer is good, but not perfect. I noticed that with many of my snippets I have to repeat the keystrokes. I think it may be TextExpander and iOS’s built-in autocorrect conflicting with each other. For example my snippet to type the word “Markdown” is m d followed by a semicolon. As soon as I type that, it changes to me instead of md. If I back up and type it again, then autocorrect allows me to use the expansion. I have to figure out a way around that. Syncing of snippets doesn’t appear to be automatic. I had to open Settings (after I found it again) and go into TextExpander settings and tell it to sync manually to pick up a new snippet I’d created the day before. I tested creating a new snippet in the iOS version of TextExpander and it worked immediately. But then later it stopped working. I went into settings and told 1Writer to update the snippets and then it worked again. Not sure why this is. Maybe it’s a limitation of the way Apple lets TextExpander talk to other apps through its API. 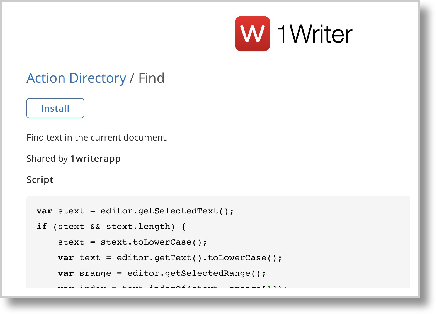 1Writer has a built-in web browser which you can enable in Settings. You get to the web browser by swiping from the right of the screen, which happens to be the exact same gesture that you use to do slideover to have two apps open at once. I had a little bit of trouble finding the sweet spot where I could get the web browser to come over and not engage slideover instead but once I found it, muscle memory made it easy to use both interchangeably. You can turn off the built-in browser, but I’m not sure you’d want to do that because it’s the tool 1Writer uses to produce your previews. Speaking of slideover, 1Writer works well with two apps open side by side. With the iPad Pro 12.9″ at least, there was plenty of real estate for me to have Telegram open in a column on the right and my full text width still showing on the bigger panel. Of course having a great text editor on iOS is only useful if you can get your files in and out, right? 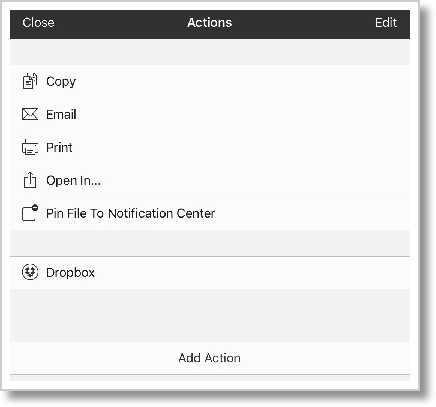 While writing in 1Writer you have an Action sheet icon in the extra row of keys which allows you to copy what you’ve written, email it out, print it, or open it in another application. If you choose Open In, you can select either as a real text document or as a PDF. Nice flexibility there. In Settings you can enable saving in Dropbox, Evernote, CloudApp and Droplr. I enabled Dropbox and then using the file structure revealed by tapping the hamburger icon in the upper left, I was able to save my documents right to Dropbox. I went to my Mac, and sure enough, this review was available to me. I opened it in Markdown on my Mac and after saving I reopened in 1Writer on the iPad and all of my changes were there. Just because I’m a giver, I also tested changing the file on my Mac while it was open on the iPad and successfully borked things up. I think 1Writer handled it gracefully – I ended up with two versions, one listed as a conflicted copy. I deleted one and everything got happy again. Another way to work on documents is to use the + button that sometimes shows up on screen on the bottom right of a documents you’re working on. I say sometimes because the only way I can get it to show up is to pretend I want to go into the file menu from the hamburger, and then go back to editing and it will be there. As soon as I start to type it disappears. Anyway, if you succeed on getting that plus button to show up, you can open documents directly from iCloud, Google Drive and more. I added the Together app which was pretty cool. I could see saving documents in and out of Together as part of my workflow. I’ve mentioned a few settings but 1Writer has tons more. You can change the fonts for both editing and previews, change the default folder where your documents are kept, toggle word count and Markdown’s inline preview, and more. Remember the Action sheets I mentioned you can get to from the keyboard? Sometimes you get 3 dots on the left bottom side of the screen which also opens Action sheets. Again I trigger it by pretending I want to go into the file browser and then coming back to editing. I really like 1Writer because it allows me distraction-free writing (I worked on this article way past my bedtime since even the clock doesn’t show while you’re writing.) Believe it or not, there’s more I could tell you about (did you know it supports Today widgets? And we haven’t even talked about Tags yet) but the word count is telling me I’m approaching 2500 words … about a text editor! I may not use 1Writer often for blogging because it’s so much easier to put in images using my Mac, but perhaps I’ll finally buy the Transmit FTP client and make that easier. 1Writer is definitely worth the grand total of $4.99US to me and I hope to find more excuses to use it. Check it out at 1writerapp.com. Nobody uses word processing any more? Allison, if it is autocorrect messing up your snippets then when you type md it should pop a box saying ‘me’ with an x that you can tap to cancel the correct before going on to the semicolon. It is a flow breaker but if you train yourself to do this and it is not one of dozens then it may help. Also .md will not autocorrect so that may be an alternative as well. Great review and I’m glad to see you accepting, if not embracing, Markdown. Now if we can convince tools to start doing Multi Markdown we will be set!